A cool vintage sailor concept. Stepping into the cafe located along the same row as Cosans Coffee, totally amazed by the ship and boat drawings on the wooden walls. 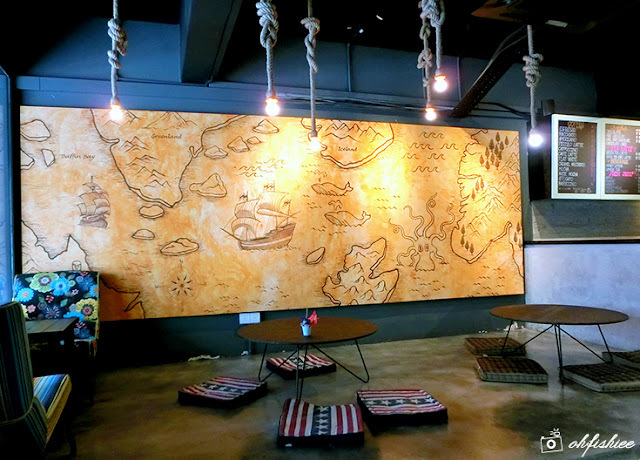 Take a good look at the ceiling, and you'll be surprised by the creative way of hanging the light bulbs using marine ropes with tie knots. In this cafe, every nook and corner is decorated in different styles, hence exude fresh and unique feel for diners who enjoy creativity. 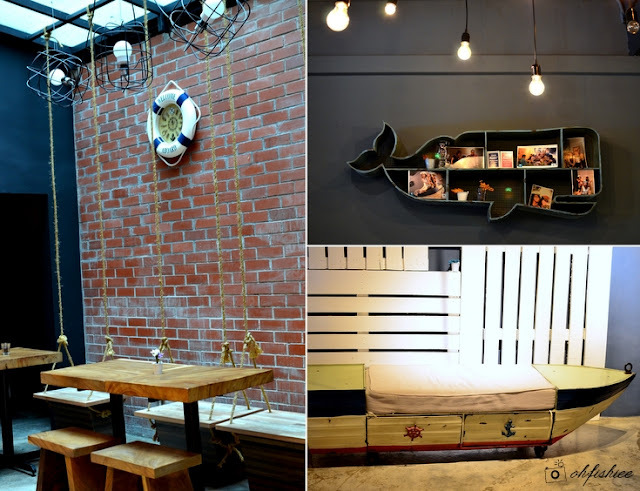 While I am fascinated by the cute whale-shaped wall shelf and colorful "boat" sofa, the best section of the cafe that I love the most is the hanging swing with plenty of natural sunkisses from the ceiling. You'll also find dainty little decors around the spacious room which complement well with the vintage nautical theme. Similar to many cafes, Ahoy also has a chiller which displays different types of sweet treats, savoury munch and bottled juices. But one thing that I love is the wide variety of cakes available here especially during weekends. With over 10 types of cakes and pastries, I really have a hard time picking my favourite because all of them look so yummy! For now, it does not serve any hand-drip coffee but plenty of the espresso-based selections are worth trying out as it uses a blend of medium roasted beans from various origins. If you are seeking for hot food, the first item to order is certainly this unique kimchi wrap that exudes a taste of Korean with American-Mexican twist. Thick chunks of kimchi, turkey ham and melted cheese are wrapped in lightly crisp tortilla skin, yielding a nice crunch and subtle tangy flavour in each bite. It is served with a bed of salad and creamy chicken mushroom soup too. It is a pleasant surprise to have such perfectly baked bagel with a beautiful crisp exterior and airy light interior. Dessert wise, the mille crepe here is injected with Bailey's Irish cream liqueur. Topped with thick dark cocoa powder, the cake is lightly sweet and the liqueur taste is very mild. 74, Jalan SS15/4, 47500 Subang Jaya, Selangor.